The Balbo Beard Co Retro Sweet Shop range of beard oils was so popular that they went from Limited Edition to a permanent product. So it is no surprise that now there are matching balms and I got my hands on a pot of the Sherbet Lemon before its release! I know that the quality of the Balbo Beard Co balms is exceptional and I loved the Sherbet Lemon beard oil and so it was going to be a balm that I liked. The base for the Balbo Beard Co balms is a creamy smooth blend of Shea Butter, Organic Beeswax, Hemp Seed Oil & Argan and it has a medium consistency. I cannot explain through words how amazing the Balbo balms are, they have to be tried for you to understand the quality. With the Retro Sweet Shop range of products, owner and creator Rhian has used fragrance oils, up until now she has stuck to 100% natural ingredients but to explore scents like the Retro Sweets you have to turn to fragrance oils. And I am glad she has, because these scents are amazing, the Sherbet Lemon is spot on for the sweets that I loved as a kid, oh who am I kidding, I still love them and more so a bag of Sherbet Lemon powder. Because of the attention to quality, to detail and the consistently amazing products and customer service, Balbo Beard Co is one of the brands that was awarded the ‘Golden Beard Award’ as a brand as a whole. I have also tried a wide range of the brands products to be able to judge this. 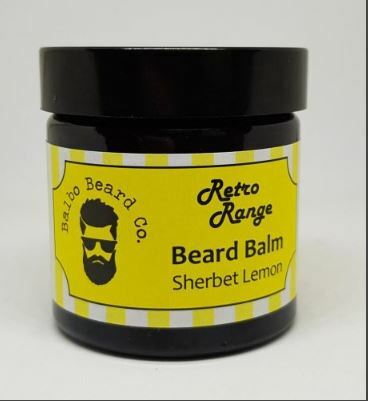 The 60ml jar of Sherbet Lemon beard balm costs £11.99 from the website. You can keep up to date with Balbo Beard Co on Facebook, Twitter & Instagram.